Buying the best punching bag for kids can be an ordeal especially for parents who aren’t as well versed in sports-related equipment. It’s our genuine purpose to arm you with the first principles towards the best choice by coming up with the basic things you need to know. Let’s get on board and get started. There are other types of games but if your toddler or kid, especially boys are into martial arts or boxer, might as well get them a lightweight boxing bag for children. Punching bag for kids come in different types and styles based on their intended purpose, size and the method of installation. We will go through the prominent types in order to give you a clue that will assist you making the right choice. 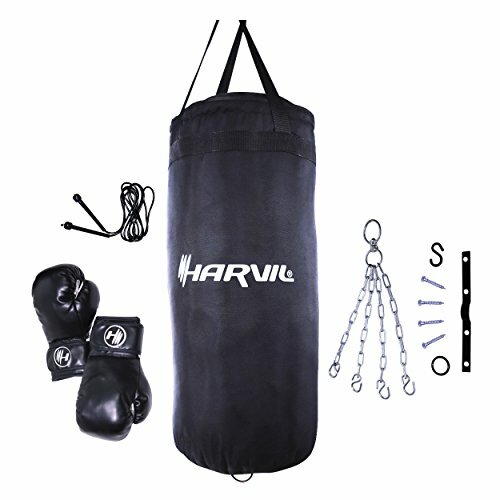 The Harvil Kids Boxing set is another great option if you are up for a lot of quality and durability. The package is well stocked and its reputation precedes it owing to the general positivity it enjoys on the market. Let’s leap forward and look at the key features and other associated aspects. In essence, it is a hanging punch bag that has a diameter of 11”, a length of 25 inches along with a weight of 25lbs. The recommended age is 4 years and above. It features a solid all-black build along with a mouthful of accessories. The accessories include a pair of Velcro strapped gloves with a weight of about 6 ounces. Apart from the gloves, the package also comes with a hanging chain that can extend to about 8 feet along with a heavy gauge welded D-ring. When it comes to ceiling attachments, it comes with a bolt plate, S and O with the associated screws. To get an extra mile ahead of most punching bags, the package also includes a nylon jump rope to aid with the pre and post exercise routines. To begin with, the material that makes this punching bag for kids up is phenomenal. You wouldn’t really expect the punching bag to break in a few sessions and so are the mounting accessories. The second advantage to notice is the rich package which comes along with the bag. The package ensures a complete set that won’t leave you with the problem of having to purchase extra accessories. Lastly, The metallic chain makes the mounting process easier than most hanging punching bags. There isn’t much that can be said about this product except that it is an incredible set. The feature set sets the bar high and it lives up to expectations in a way the rest of the punching bags in this review struggle. The next punching bag for kids we will be considering is the Pirate Knock Out Boxing Set for Kids. It should be the first hanging bag in this review and it enjoys a lot of fame on popular review sites. Let’s see if there is anything that properly justifies this. This punching bag for children boxing set comes in a well-built punching bag with two principle colors, red and black. The middle 2/3 is black with a graphic of a pirate while the two ends are dressed in red. The punching bag weighs at 2 pounds and extends through to a height of 20 inches. It comes with a hanging rope to enable a vertical attachment. The boxing gloves are well padded and come with Velcro straps to assist with the fitting. When it comes to the recommended age, the manufacturers suggest an age range of 3 years and above. Firstly, the punching bag provides a durable option that has the capability to withstand busy days of constant punches. This is due to the durable Vinyl material and a solidly built hanging rope and straps. The weight and dimensions should also be ideal for a fairly manageable installation process. When you consider the price range, considering the quality, this is a lot of value for the associated figure. Adding to the great price and other advantages, the gloves are designed in a way that can fit with a wide range of hand sizes, and the padding also provides a comfortable experience that effectively safeguards against the common injuries. Being a hanging punch bag, it comes with a predictable problem of maneuverability. Hanging a punching bag often means you are limited to a single place and also the environment may make it tricky when mounting the bag especially when you don’t have definite places to attach the rope. Having considered our view and customers views, it’s easy to notice that this is a children’s punching bag that is bound to give a lot for the coin it demands. The design is simple but yet exciting, the material is classic and the overall experience it provides should encourage any enthusiast. Let’s move on and switch to the next punching bag in ‘Punching Ball with Stand and Gloves‘. It may not have the cutest of names but there is a lot it can offer to justify inclusion the competition. Let’s follow the same footsteps and consider the features, related views recommendations. 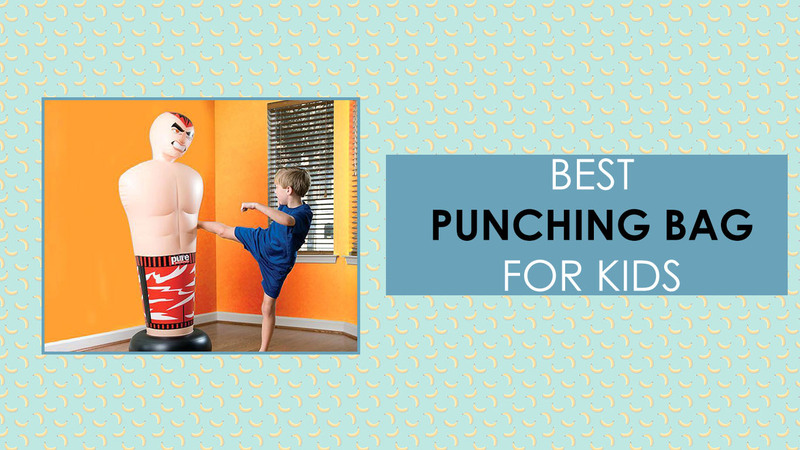 This kid punching bags are a little different from what we’ve considered so far. In essence, it is a free-mounted punch bag but with a different base and the actual punch bag. The punch bag is basically mounted on a telescopic stand which is attached a at the bottom. The is where the child stands as he is throwing the punches and it is about 26.5×75” in terms of the length and the width. The height of the stand can be adjusted between 35-50 inches. This range implies that the bag is for children which are 6 years and above. The ball is 9.5 inches in terms of diameter and it works with the spring system in such a way that it gets back to the original position when it is punched. Firstly, the punching bag has a very pleasing design that gives it an air of excitement and modern sophistication. The build and material pretty solid along with a simplified mounting process. The mechanism can be intimidating financially but the features provide good value for the money. When it comes to space, the bag doesn’t need a mammoth amount of space in the along with being very easy to move around the house. There seems to be a common complaint if you read the reviews critically and this is the bolt system it uses to keep things in place. The bolts need tightening on a frequent basis and this can disturb the fun as the system fails with time. All in all, this punching bag provides a simple system that offers a lot of quality and fun to the child. The advantages far outweigh the disadvantages, and generally, the reviews reveal an encouraging trend. SIMPLY GREAT VALUE FOR THE 35 DOLLAR. 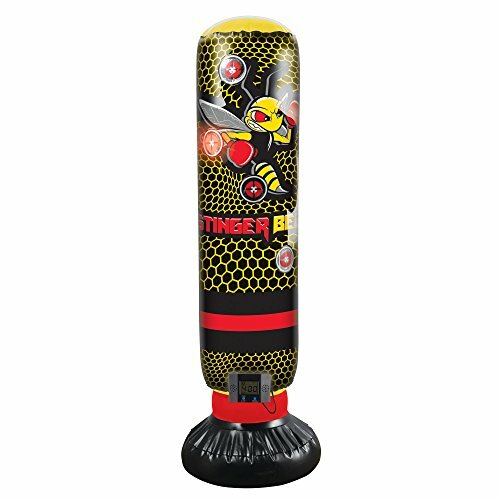 Next up on our list is the Franklin Sports Stinger Bee Inflatable Electronic Boxing Set. This punching bag for toddlers or kids brings with it a lot of quality that makes it a favorite on most shopping lists. A good feature set and a solid build a great addition to the little boxing superstars training or play kit. Let’s get to the features. This set comes in a beautifully design freestanding punch bag with a rounded base at the bottom. It’s obvious the designers put a lot of effort into the visual effects of the punching bag with a colorful honeycomb graphic that should be a delight to most kids. The material of Vinyl and like the Kid Kick Wavemaster, it is an inflatable bag that incorporates into a water chamber at the base that helps with keeping it sturdy. In terms of space, the bag has an assembled size of 42″ x 19″ x 19″ thus promising a equipment. The package also includes some really exciting youth gloves that should tempt an adult to join the fun. When it comes to age, it is suitable for kids of more than six years, according to the manufacturer’s recommendations. The first good impression the bag gives is the aesthetic and exciting design it comes in. Kid’s fun involves much more and the looks of an equipment a lot to do with the amount of fun, and it is obvious that the punching bag takes this aspect seriously. Another great aspect is that the size and weight, along with the fact that it is freestanding, makes it considerably easy to move around along with the easy installation process it provides. The price tag provides a really affordable option that is exciting considering the superior feature set it brings on the table. Additionally, the boxing gloves also provide great protection to your child’s knuckles and wrists thus raising the safety profile of the bag. There to be issues of leakage with the punching bag based on more than three reviews we obtained. This is a potential problem that does not really fit the beautiful and exciting design the bag possesses. Overall, the features and overall design of this bag is impeccable and should be a lot of fun to have in the house. Much as this is the case, the low rating along with a record of leakages should be enough to warrant a critical examination of your decision to have it on board. The next punching bag we are going to consider is the Pure Boxing Tough Guy Kids Punching Bag. features and material warranted its inclusion on this list. Let’s get on and see if this holds any truth at all. 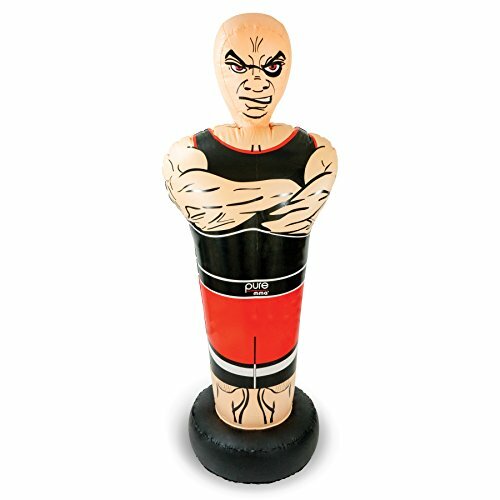 It is a freestanding punching bag that has a life like look of a tough guy. It is clear a lot of creativity went into this bag giving it the advantage of providing the kid with the opportunity to practice aiming and precision. This punching bag for kids extends to a height of 56 inches and has a total item weight of 4 pounds. In case you are worried space issues, it can eat up a space of 13x13x56”. When it comes to the material, it is made of Vinyl which is quite a reliable material. The punching bag is inflatable by means of sand and water and is suitable for children with more than 6 years. First of all, you will notice that it goes at an affordable price and yet it provides a lot of value that rivals most top end bags. Secondly, you will but notice that it won’t really pose some space issues due to friendly dimensions it possesses and the fact that it is a freestanding punching bag. Another feature worth noticing is that it is fairly easy to mount and get started. You don’t need a host of accessories to get it running. Lastly, the Vinyl material provides an ideal solution to make it last longer than the daily punches it will be taking from the little one. The punching bag has but one disadvantage which is, in an honest sense, a small island in an ocean of greatness. After a careful review, we found out that there was a solitary complaint that the sand base is fairly hard to fill, along with a few complaints related to leakages. All in all, this is a great addition to the playroom. 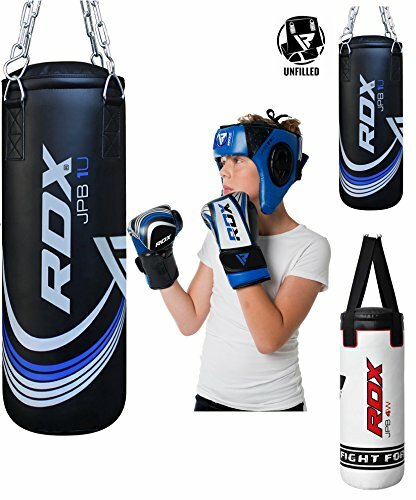 The feature set seems to not lack the quality that a top punching bag needs and this is evidenced an overall positive response from the consumers themselves. 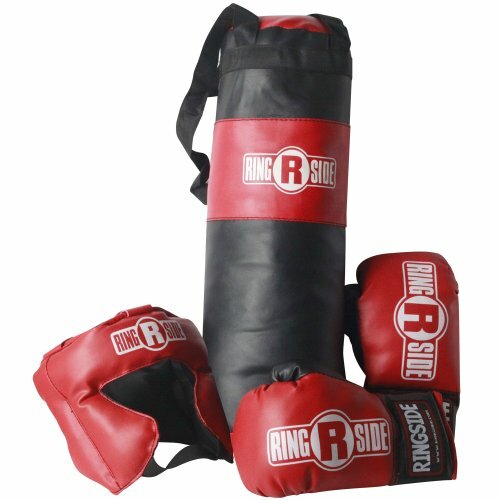 This set provides a Red freestanding punching bags incorporated in a black round base. The material and build of this punching bag may not be leather or vinyl but it still offers a great durable option in Nylon and highly resistant foam material. The outside cover is made of nylon whereas the inside is fortified with foam material. Another great feature associated with this product is that it allows you to adjust the weight. Unlike most bags on the market today, you are able to fill the inside with sand or water to achieve the desired weight. In general terms, the maximum the bag can get is 170lbs which is basically adequate to handle the physical insults of the child. When it comes to age ranges, it is not recommended for children of more than 11 years of age. In addition to the adjustable weight, the Kid Kick Wavemaster punching bag for kids height is also adjustable thus offering the advantage of accommodating a wide range of weights and heights. Being a freestanding punch bag, the Wavemaster punch bag should definitely provide most of the advantages that come with freestanding punch bags. It is easy to move around owing to the fact that you don’t need a lot of dismounting to do before you change places and also the fact that you can easily deflate it by removing the sand or water from the inside. Adding to this advantage, the Wavemaster boxing bags can be mounted securely as it has a sturdy base that can easily hold the weight of the bag along with the force from the child’s strikes. The material used also provide a dependable and durable solution to the needs of the child’s workout. The double layer of nylon provides a lot of strength to withstand the sustained rounds of punches. In addition to the quality associated pros of the product, the manufacturer ensures us of their commitment to providing quality through the one year warranty that comes with the product. One of the most prominent concerns we have about the Wavemaster boxing bag product is that it isn’t really an appropriate choice for children older than 11years and much as it is adjustable it may still not be a good fit for kids with colossal heights. Another concern we have encountered especially from customer reviews is that it is associated with producing some unpleasant noise when the action is taking place in the playroom. The last but not least punch bag in our review is the Ringside Youth Boxing kit. It is obviously of the most famous boxing kits today due to some superior features it puts on the table. A fair share of our attention should do this boxing kit great justice. 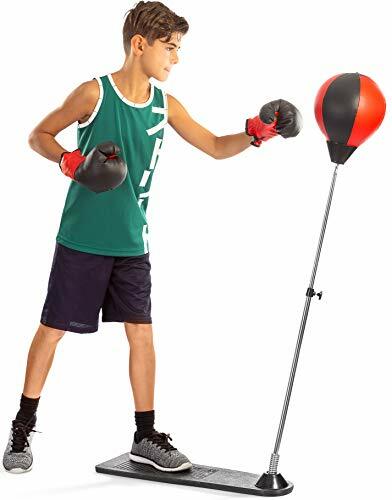 The kid’s punching bag set includes a bold combination of a , a punching bag and a pair of gloves with two main principle colors in red and black. The mini bag has a weight of 2 pounds, and dimensionally, it goes by 17 inches and 5 inches of the length and height respectively. The headgear is slip-on and has an elastic chin strap to be effectively secured in place. First of all, it quite evident to notice that this punching bag was built for endurance while providing the fun and sports development for the kid. The price tag provides an affordable deal for a mid to fat budget at hand thus adding to the positives about the product. When it comes to space, the product dimensions show that you may not really need to shift a lot of things to accommodate the punching bags. The safety profile is also top notch as it includes Velcro strapped gloves with a great headgear to teach the young one the values of safety from a young age. Perhaps an obvious shortfall in this equipment is the packages lack of mounting accessories to assist with the installation process. You may have to purchase the mounting accessories separately. Another disadvantage is something we would expect from a hanging punch bag, which of course is the lack of maneuverability. Once you get it mounted, it is a bit of a hustle to change rooms or places within the room. The ringside Youth kids Boxing Kit Training Bag is definitely a huge step towards making a champion out the little one through providing an ultra-high quality punching bags that should stand the sternest of childhood hostilities. Buying the best punch bag can be an ordeal especially for parents who aren’t as well versed in sports-related equipment. It’s our genuine purpose to arm you with the first principles towards the best choice by coming up with the basic things you need to know. Let’s get on board and get started. Punching bags come in different types and styles based on their intended purpose, size and the method of installation. We will go through the prominent types in order to give you a clue that will assist you making the right choice. What are the basic types of punching bags out there? These are by far one of the commonest and most famous bags on the market and they are basically large and cylindrical bags that are usually attached vertically by means of ropes. Their main purpose is to enhance strength and power through giving the athlete or child the opportunity to practice some power enhancing body punches. The mounting method is the main distinctive feature in this type of punching bags. Instead of being suspended through chains and ropes, this bag uses a weighted pedestal that balances it in space to achieve a vertical freestanding position. As the name suggests, these bags were designed to enhance speed and coordination. In essence, they are usually air filled bags that are suspended through a platform that is positioned parallel to the ground. The bags exist in different sizes and weights. Larger bags are slower and heavier thus necessitating more power input from the athlete. Smaller bags a lighter thus making the athlete to focus more on speed and endurance. These hold an almost similar function to the speed bags but the main difference is the way they are mounted and the overall structure of the apparatus. They have a cable system that attaches to both the ceiling and the floor. This design enables the bag to react at different angles and speed thus giving the trainer a broader workout that challenges speed, coordination and balance. Having considered the different types of punch bags, let’s have a few moments to look at the important factors you need to look at before spending anything on a punch bag. The size and weight are definitely two factors worthy of your consideration as they may pose a genuine safety threat if not treated with a little more thought. A huge and heavy bag may mean more fun for the child but it has the potential to hurt the child after a back-swing. Getting the right size means taking a few moments to measure the weight of the child and then choose the corresponding punching bag. To keep it simple, the first step involves measuring the child’s weight and then this is followed by getting a punch bag half the weight of the child. IS IT A FREESTANDING PUNCHING BAG OR HANGING? Depending on the available space, you will need to establish whether you will go for the freestanding punching bag or the hanging type. A standing punching bag can be appropriate in situations where you do not have a lot of space at your disposal. It provides you an option which is easy to move about when needed to and does not really give you a huge challenge in terms of storage. An additional advantage is that the punching bag does not need you to have accessories during the process of installation. CAN THE MATERIAL STAND THE TEST OF TIME? You don’t really want a punching bag that won’t be able to take the multiple punches for a sustained period. Leather and Vinyl provide the best materials that guarantee the much needed endurance. Leather provides a more natural alternative of the two and just like Vinyl, it will take a lot more time to show signs of cracks or tears. Gloves are an indispensable factor when it comes to an ideal punch bag kit. Yes it is good to be confident and tough but hitting a punch bag without the protection from gloves can be cause a lot of undesirable and retrogressive effects like swollen knuckles and cuts. All great gloves should be a good fit and light for the hands. The material should be resistant enough and the inside should be cushioned by adequate foam material. Hand straps also take safety to a near perfect level by providing the needed stability for the wrist to avoid pain issues and carpal bone fractures. DOES IT OFFER THE CORRESPONDING VALUE FOR THE CASH? Don’t just get any bag because you can afford it. Cheap stuff are a joy to buy but you are bound for quality associated headaches in the long run. You will need to check the kind of features that the bag is providing including the material and the associated hardware. It pays little to just rely on your judgement because you may miss some of the practical issues that may be difficult to see from manufacturers websites. You need to have a look at the kind of experience it is giving to the current or former users. Authority sites like Amazon provide some really important reviews from users along with general user ratings that can enhance your understanding of the kind of quality you are getting. Having considered the essentials, let’s look at the best punch bags on the market in light of the special features, what we think about them and what other customer’s views are. To put the punching bag matter to rest, a great choice is a matter of finding the balance between quality and the financial muscle at hand. It’s really about understanding the principles associated with making the best choice, having a grasp of the key features and finding the best fit for the pocket, and of course, your needs. All the best as you are making your choice and doing your best for the little one!